Cinderella Tickets Now On Sale! If you take 34 cast members, 20 crew members, four directors, six weeks of rehearsals, five Saturday shop calls, 20 gallons of paint, oodles of costumes, and five scenic locations, and add them all together, you get Wakeland High School Theatre Department’s production of “Cinderella.” The theatre department has been hard at work this school year in order to put on a great show. Rodgers & Hammerstein’s 1957 movie musical was originally written for television and starred Julie Andrews in the title role. There have been two additional television adaptations; the 1965 version starring Leslie Anne Warren and the 1997 version starring Brandy with Whitney Houston as the Fairy Godmother. The musical has been staged on Broadway numerous times, the most recent production having just closed on Broadway is still out on tour. 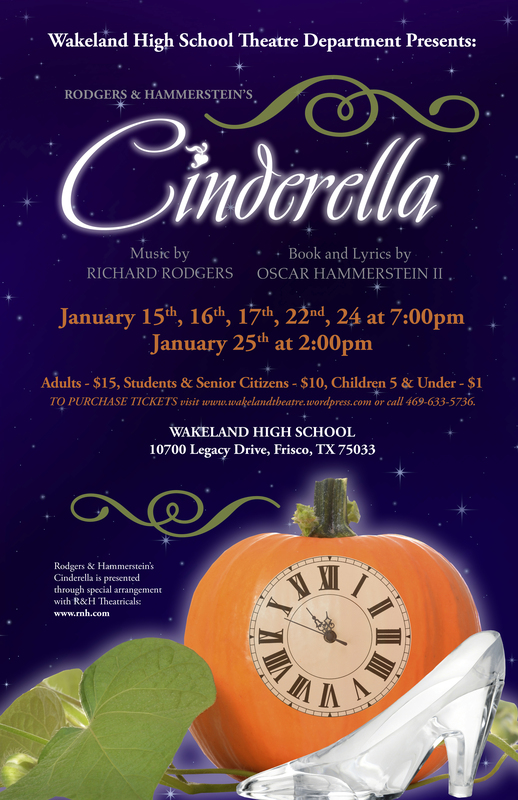 Wakeland High School is producing the original version of the musical. play was adapted into the musical WHS is performing. The show features music by Richard Rodgers, with book and lyrics by Oscar Hammerstein II. “’Cinderella’ is the fairy tale that has filled every little girls’ head since childhood, reminding them of dreams and seemingly magical impossibilities coming true.” says junior Summer Perrin, who is proudly portraying the title character. Junior Mason Doerr, who plays Prince Christopher, says “This show is something for everyone to enjoy. Families can come and be blown away by the magic of live theatre”. $15 for adults, $10 dollars for students and seniors, and $1 for children 5 and under. Tickets will also be available at the door pending availability. So join Cinderella, Fairy Godmother, Prince Christopher and many more as they share the story of one of our most beloved fairy tales.